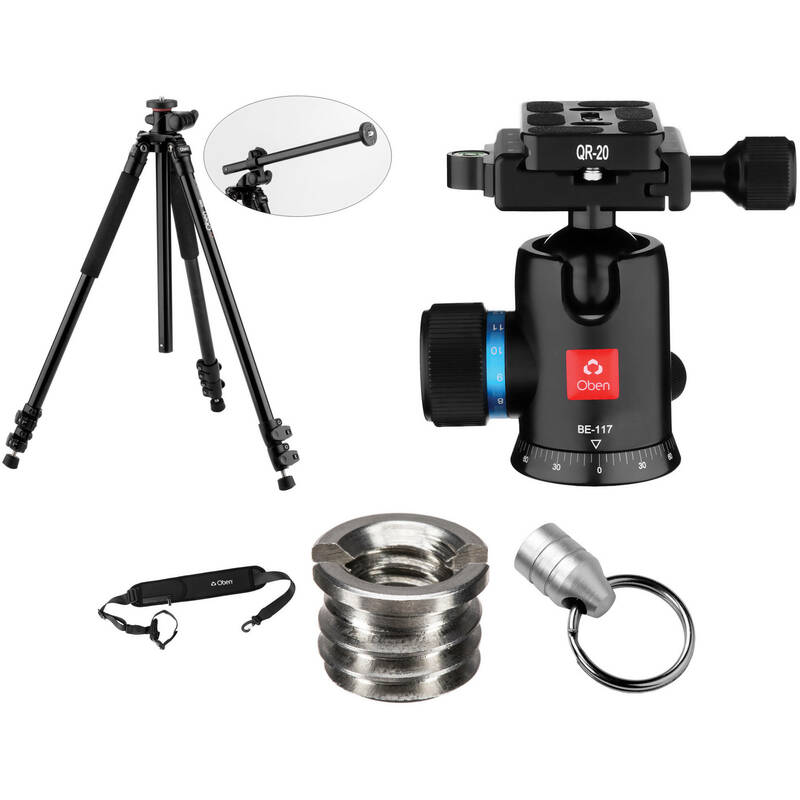 This kit from B&H includes the Oben AC-2341L Lateral Tripod and BE-117 Ball Head. The tripod is a sturdy, professional support for any DSLR, point-and-shoot camera, or a compact camcorder. With a load capacity of 10 lb and a maximum height of 69.5" including the head, the lateral tripod features a tilting, swiveling center column that enables flexible positioning for macro photography and other uses. Engaging the lateral adjustment lever frees the tilting of the center column once it's been extended past the chassis, which becomes possible by pressing the button at the column's bottom to disengage the safety bolt. Once extended, the column can tilt from its original 0°, straight-up-and-down orientation, to a 180° upside-down orientation - with possible stops everywhere in between, including a 90° lateral position. Twisting a knob on the chassis locks and unlocks the 360° swiveling of the center column and its upper collar. The tripod's flip locks, which enable the extension and securing of the leg stages, are user-adjustable. By using a supplied hex key, the user can tighten each spring-loaded flip lock to safeguard their continued reliable performance. When it's not being used in its lateral mode, the AC-2341L's rapid center column functions like any professional tripod, extending after a twist of the knob on the upper collar. The tripod's center column can also be removed from both the chassis and the upper collar so that it can be reversed. For protecting your camera when the column is retracted quickly, there's a rubber damper under the center-post collar. Steel locking screws underneath the center-post collar enable you to fasten a camera head more securely. Push/pull locks allow you to set the positions of the three legs independently at three different angles. This allows you to shoot from low angles or on uneven terrain. For stability on softer terrain, the AC-2341L features metal spikes that retract and emerge by twisting the foot's rubber portion. The included BE-117 ball head is a lightweight aluminum ball head that features an Arca-type compatible quick-release system. It has a large locking knob to control the movement of the ball, and a separate knob for the 360° panning movement. The BE-117's multiple knobs help make taking panoramic photos simple by allowing you to pan a specific number of degrees while keeping the head's tilt position locked. In fact, the BE-117 features degree markings around its circumference to aid in that task. A notch in the ball head allows you to quickly change between portrait and landscape orientation. The included quick-release plate attaches to your camera via its standard 1/4"-20 screw, and is secured in place with an Arca-type clamp. A locking knob controls the opening and closing of the aluminum clamp simply and reliably. Two safety screws on the bottom of the plate help prevent your camera from accidentally being released when adjusting the plate fore and aft. Multiple bubble levels help ensure that your camera will be level with the horizon. The AC-2341L 3-Section Aluminum Lateral Tripod Legs from Oben is a sturdy, professional support for any DSLR, point-and-shoot camera, or a compact camcorder. With a load capacity of 11 lb and a generous maximum height of 65.8", the lateral tripod features a tilting, swiveling center column that enables infinitely flexible positioning for macro photography and other uses. Engaging the lateral adjustment lever frees the tilting of the center column once it's been extended past the chassis, which becomes possible by pressing the button at the column's bottom to disengage the safety bolt. Once extended, the column can tilt, with no ratcheting, from its original 0°, straight-up-and-down orientation, to a 180° upside-down orientation – with possible stops everywhere in between, including a 90° lateral position. Twisting a knob on the chassis locks and unlocks the 360° swiveling of the center column and its upper collar. The tripod's flip locks, which enable the extension and securing of the leg stages, are user-adjustable. By using a supplied Allen key, the user can tighten two points on each spring-loaded flip lock to safeguard their continued reliable performance. With its anodized aluminum construction, the AC-2341L is ready to survive the rigors of professional work. The tripod chassis is cast aluminum for further durability. Pull-in/push-out positive leg locks allow you to set the positions of the three legs independently at three different angles. This allows you to shoot from low angles or on uneven terrain. For stability on softer terrain, the AC-2341L features metal spikes that retract and emerge by twisting the foot's rubber portion. The BE-117 Ball Head from Oben is a lightweight aluminum ball head that features an Arca-type compatible quick-release system. It has a large locking knob to control the movement of the ball, and a separate knob for the 360° panning movement. The BE-117's multiple knobs enable higher-precision adjustments to the head than are possible with single-lever heads. Taking panoramic photos is simple, for instance, because you can pan a specific number of degrees while keeping the head's tilt position locked. In fact, the BE-117 features degree markings around its circumference to aid in that task. A notch in the ball head allows you to quickly change between portrait and landscape orientation. The included quick-release plate attaches to your camera via its standard 1/4"-20 screw, and is secured in place with an Arca-type clamp. A locking knob controls the opening and closing of the aluminum clamp simply and reliably. Two safety screws on the bottom of the plate help prevent your camera from accidentally being released when adjusting the plate fore and aft. One bubble level on the clamp, and another on the locking knob, both ensure that your camera will be level with the horizon. The TS-110 Deluxe Tripod Strap with Swivel Clip from Oben provides you with an easy way to always have your tripod with you. The strap is designed to fit tripods that have an attachment hook. It's adjustable from 34 to 40" and features a 3.25" wide neoprene shoulder pad. One end of the strap contains a swivel clip that attaches to the tripod's attachment hook. The other end contains a quick-release connector that wraps around your tripod's leg. The strap features an accessory pocket for small items. This 3/8"-16 to 1/4"-20 Reducer Bushing from Oben allows you to convert any standard 3/8"-16 thread for the insertion of a standard 1/4"-20 screw. This way you can, for instance, mount a professional-style head with a 3/8"-16 threaded hole on a tripod that has a 1/4"-20 screw. The bushing is a replacement part for Oben heads, and it will work with all Oben monopods and tripods also. The Oben Tripod Hanger attaches to a tripod's 1/4"-20 camera screw, allowing you to hang it from a hook for convenient storage or display. The hanger is an ideal accessory for studios, newsrooms, rental houses or for anyone who wants to organize their gear and free up floor space. Box Dimensions (LxWxH) 33.0 x 5.0 x 5.0"
Box Dimensions (LxWxH) 4.8 x 4.2 x 3.5"
Box Dimensions (LxWxH) 17.4 x 3.8 x 1.6"
Box Dimensions (LxWxH) 3.3 x 1.95 x 0.3"
Box Dimensions (LxWxH) 3.5 x 3.0 x 0.5"
AC-2341L Tripod with BE-117 Ball Head Kit is rated 5.0 out of 5 by 1.